Your friends are busy. Your friends are forgetful. Your friends don’t fully understand that not showing up is a big deal. Guests who don’t warn you that they aren’t coming will cost the artist money, and create more work and snack expenses on your end. It is absolutely worth your time to check in with your invitees and make sure those RSVPs are solid. Again, short emails are the best, and adding a single picture is a nice touch. Here’s what I send 2 days before every show. Subject: Confirmation: Next TenTen House Concert this Tuesday night! Please let me know if your plans have changed. Otherwise we’ll expect your smiling face at 6:30pm. Concert starts promptly at 7pm. Entrance at corner of 3rd street and 4th avenue south. Street parking available on both roads. BUZZ Fran Snyder at entrance, pull door on right when you hear tone. ELEVATOR is inside through the doors on the RIGHT. Here’s the webflyer with the other details again. $10 donation, snacks, done by 8:30pm, etc. It’ll be a fun night! The second biggest challenge to hosting house concerts (after attendance) seems to be finding the right balance for the collection of donations. The standard for house concerts is a “suggested donation,” and the reasons for that are the protection of the host and the building of community. Zoning regulations vary by location, and a suggested donation does not mean you can’t be challenged by various authorities for your house concert activity. The larger your shows are, the more at risk you place yourself for this kind of exposure. What is clear, however, is that “selling tickets” or “charging admission” breaks the zoning rules of most residential areas, and that kind of language would almost certainly void the terms of your homeowner’s insurance policy. 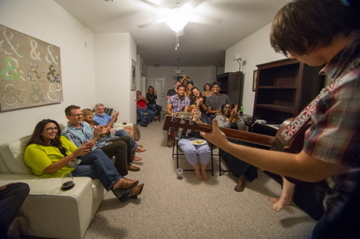 Tens of thousands of house concerts happen every year without incident. That said, we have to advocate for the safest practices. Your house concerts can become a liability if they stretch the bounds of what can be called a private party in your home. If you want to “sell tickets” or “charge admission,” you’ll need to consider getting a business license or zoning approval. So back to the suggested donation. you are collecting a flat fee ahead of time, by check or paypal. if you sit next to a cash box and collect a flat fee from every person who comes in. But if I don’t do that, the artist could miss out on a lot of money! That’s right. So here’s what we recommend. Make sure the suggested donation is clearly noted in every communication about your event. The invitations, the posts, and the reminder email. Put the donations jar, bucket, or basket or near the front door – away from the CDs. Make a clear sign with the donation amount/range. Try one of these. Have someone (volunteer or you) greet each guest as they come in, and invite the guest to sign in and make their donation. Turn your back and let them donate what they want/can. Why sign in? So you can keep track of who actually showed up from your RSVPs. If you want to create A and B lists (reliable guests go on your A-list!) then you can make sure to invite them first every time, and have greater confidence in your numbers for each concert. Over time, your friends learn that the suggested donation is expected. Hopefully, you also get the message across to key friends and neighbors that you want them to experience this, and if they are going through a financial rough patch they can give a little less. These steps keep the spirit of the suggested donation, while honoring the artist with a steady and smart effort to get everyone to contribute. As a host at ConcertsInYourHome.com, you can take some basic steps to make the promotion of your events easy. Subject: I’m hosting a house concert (4/24) and you’re invited! Please join me on Thursday, April 23rd for wonderful concert in my home. [Artist Name] will be playing an up-close and personal concert for me and a select group of friends. In the link above, please check out the music, the details and suggested donation. Let me know if you can give a solid RSVP and if you’ll be +1 or more. I’ll send directions and a little more info when you confirm.